When I decided to spend a few months freelancing as a research consultant in 2016, I could never have predicted the rollercoaster ride that lay ahead. Three and a half years later, research agency Patternmakers is a thriving team of five. We’ve conducted research in five Australian States and Territories, the UK and in several Asian countries, helping culture professionals use evidence to grow their audiences, secure funding and amplify their impact. Our monthly Culture Insight & Innovation Update, which started as an informal bulletin for a small network of colleagues, is now read by hundreds of culture professionals around the world each month. Over the same timeframe, my team has delivered four new babies into the world! Needless to say, we are learning a lot about balance, prioritisation and perspective. As 2018 draws to a finish, I thought I'd reflect on the successes and challenges of the year. In January I completed the final residency of the Arts Leaders Program, and returned to working four days a week after my baby break in 2017. It was an honour to participate in the program from 2015-2017 and learn from some of Australia's most exciting artists and arts managers. Particularly during a time when I was faced with a lot of choices to make about my career, family and lifestyle. If you're considering applying to the program (or taking on any career challenge) while raising a family, I wholeheartedly encourage you to go for it! Do get in touch if I can help you in any way. In February, Patternmakers was appointed by the Victorian Government to conduct a Review of Touring and Engagement, in partnership with Professor Peter Matthews. Travelling across Victoria throughout March, we held six open forums, conducted interviews and visited cultural sites - and saw with our own eyes the importance (and further potential) of a strong touring environment. A great chance to enjoy Victoria in all its autumnal magnificence! The complexity of touring made this project enormously challenging, but it goes without saying that the chance to contribute to its future is rewarding. Having delivered our report, we are continuing to work with Creative Victoria to refine the recommendations and operational considerations ahead of further announcements in 2019. In April we were appointed Impact Partner to BlakDance, and will be working alongside the organisation over the next three years to 'catch' and 'keep' stories about First Nations dance. I'm grateful for the opportunity to refine our practices with our Aboriginal and Torres Strait Islander colleagues, I know we’ll learn a lot. I’m really excited that it’s not just a one-off project, but a three year relationship. We'll be sharing our insights with you as this work unfolds. Vivid Sydney arrived in May 2018 and we were delighted to present a sold out discussion event, Data after Dark at the 107 rooftop in Redfern. It was a spectacular evening of wine, cheese and statistics (a match made in heaven!). Based on the success of the evening we will be expanding the event into a discussion series that will be touring Australia in 2019. Please get in touch if you think this sounds like something you need in your life! Since mid-2017 we have been working with Creative Victoria to develop an Audience Research Toolkit for creative arts organisations. Based on interviews and a sector survey, the toolkit will provide practical guidance and tools to support research practices in small to medium creative arts organisations. In June 2018 we piloted the tools with a number arts and culture organisations in Victoria, and it was fascinating to see how the tools measured up in practice! The finalised resources are due for launch by Creative Victoria in early 2019. In July 2018 we restructured the business as a company, and welcomed ‘Patternmakers Pty Limited’ to the world. With this change came a new constitution, new accounting software, bank accounts and new employee agreements. Embedding new systems is always challenging (am I wrong?) but I'm confident this new structure is the right move for everyone. Thanks for your support throughout the transition! In winter we travelled to Horsham, Colac and Castlemaine as a part of three Full House projects to develop evidence based audience development plans for regional arts facilities. In each location, we conducted interviews and focus groups with business leaders, artists, service providers and residents - exploring what is working well, and where there are opportunities to improve. Regional work is demanding logistically - but we are addicted to getting out of our city lives and hearing about different ideas, lifestyles and values. We're really excited to see this evidence being applied to programming, marketing and venue management in each location - and following the journey of these communities over the next 3-5 years. In Spring we were delighted to explore results of two projects concerning young people. Firstly, working with the Museum of Contemporary Art, we surveyed 800 people under the age of 32 about their experiences of visual arts and the MCA GENEXT program. Stay tuned for the published report in early 2019. 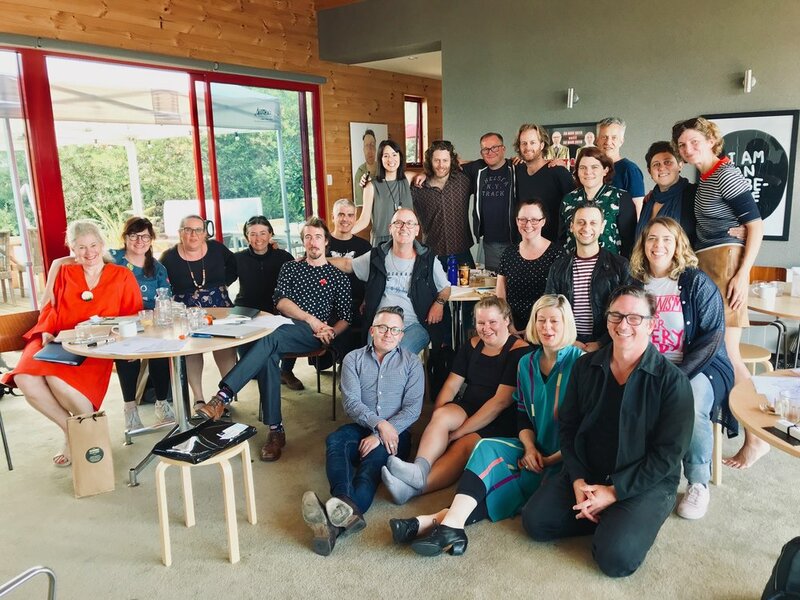 Secondly, working with Barking Gecko Theatre Company, we explored the impact of its Ensembles Program and discovered very promising results for this emerging program, which is active in remote parts of the country like Karrutha, WA. Working with young people makes me feel old, but fills me with such hope for the future that I know it will be an area we continue to investigate in years to come. The team continues to grow with talented new researchers joining us, like sociologist Dr Catherine Davis. In November we farewelled Research Manager Brooke Boyce, as she prepares to welcome a new baby this month. It’s always hard farewelling close colleagues, but new people breathe new life into the team as well! I should mention that we also officially welcomed Bianca Mulet to the team, after a three-month internship with Patternmakers. As a part of her capstone subject Social Inquiry at UTS, she investigated the role of evaluation for arts and culture organisations in Australia. I’m really proud of Bianca’s journey with us, and we'll shortly be releasing her report, which (of course) received a high distinction! Thank you to all our friends, colleagues, partners and clients for a wonderfully rich and rewarding year. We'll be taking some time out to reflect and recharge - and hope you too enjoy the break. Patternmakers’ Founder and Managing Director Tandi Palmer Williams is an experienced consultant and arts and culture research specialist.